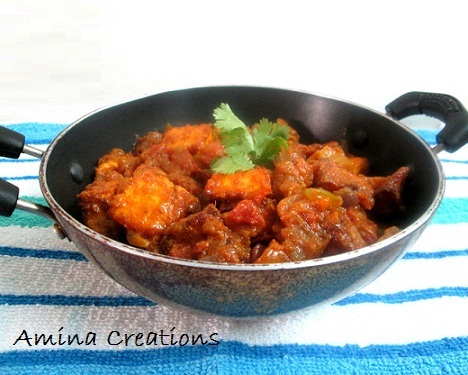 Kadai paneer is a spicy and delicious paneer gravy made with tomatoes and capsicums. This is my family’s favourite paneer dish and we often serve it with chapathi or roti. You can also check out my other paneer recipes like Capsicum paneer gravy, mutter paneer, palak paneer, paneer peda, malai kofta, paneer burji and rasgulla by clicking on their links. Prepare paneer from 1 litre of milk using the method given in my earlier post. Or you can also use ready made paneer from the market. Heat oil in a non stick pan and stir fry the paneer cubes till golden on both sides. Take warm water in a bowl, add a pinch of salt and add the paneer cubes. Allow the paneer to soak in warm water for about half an hour. Heat oil in a pan and add onions. Saute till they turn golden. Next add tomatoes and cook for a few minutes till they turn soft. Now add red chilli powder, coriander powder, turmeric powder, garam masala powder and salt and mix well. Now add capsicums and cook for a couple of minutes. Then add 1 cup of water and bring the gravy to a boil. Cook for a few minutes and when the gravy starts thickening add the paneer cubes. Mix well, cook for a minute and switch off the gas.